The couple beside me then engaged me in one of those pithy conversations one sometimes has with strangers. We discussed Matthew Shepard’s death and legacy today, here at a time in which societal unrest and bigotry are sadly on the rise. Shepard was the University of Wyoming student who in 1998 was tied to a fence and murdered in one of the most horrific gay hate crimes in modern history. His death led to the passage of the Matthew Shepard and James Byrd Jr. Hate Crimes Prevention Act in 2009, and the formation of the Matthew Shepard Foundation, which promotes antiviolence awareness through a variety of initiatives. He has also inspired a plethora of writings, films, and musical projects from the arts community, [one of the earliest and most widely known being Moisés Kaufman’s 2000 play The Laramie Project]. Craig Hella Johnson’s 2016 modern-day Passion is quite conceivably the most powerful artistic response to Shepard’s story to date. The composer of Considering Matthew Shepard and the artistic director of Conspirare, Craig Hella Johnson leads a performance from the piano.Johnson is an interesting guy. His conversational style reveals an understated intensity graced by palpable brilliance and enveloping warmth as we discuss a journey of artistic creation that became “deeply personal” for him. Born in Crow Wing County, MN, Johnson began piano studies in childhood. He attended St. Olaf College and pursued graduate work at the University of Illinois and Juilliard before scoring a fellowship to study with Helmuth Rilling at the Internationale Bachakademie Stuttgart. He later completed his doctorate at Yale. Johnson has directed choral ensembles throughout the country, was director of choral activities at the University of Texas, and is now a resident artist at Texas State. Most significantly, he is the founder and artistic director of the Austin-based, Grammy Award–winning ensemble Conspirare, with whom he is leading a national tour of Considering Matthew Shepard this fall and spring that first comes to Ravinia on September 12. Johnson’s compositional style has been described as “collage,” a pastiche of disparate influences with bits of pop, folk, and jazz coursing through an essentially classical structure. The work begins, appropriately for what is fundamentally a Passion, with a quotation from Bach; the opening measures of Ave Maria. The initial choral entrance then gives way to an idiomatic cowboy song, which immediately establishes locale. “I wanted to allow a naturalness for a modern audience,” Johnson explains. “There is a big part of me that is pretty straight-up orthodox choral guy. I trained in Bach. I love those big forms. I have a foot firmly planted in the canon, and I could be happy living my life with them, the Passions and the Elgar things. The commitment to oratorio was also there. I am sad to see that form die away. There are not many composers writing oratorio anymore; it certainly isn’t in our listening palate all that much, so I am interested in keeping this larger storytelling medium in play. I also was interested, for musical and cultural reasons, to have as broad an audience as possible invited in. I wanted both musical integrity and accessibility. I had an advantage in that I was not labeled early on as a composer, so I didn’t have pressure to see what my ‘voice’ was. I tried to serve this story, and I tried to honor that in the musically pluralistic world we are living in, having grown up with the iPod shuffle becoming everybody’s norm. So nothing I do here is unusual in terms of how people listen. It is maybe unusual in the concert hall for purists, but I wanted to preserve a naturalness. Getting the oratorio on its feet was an emotional time for all involved. “The story is a lot to hold. To ask a row of tenors and basses to sing those awful words in the movement “A Protestor”—‘The only good fag is a fag that’s dead’—those were challenging things. I was incredibly moved by the singers’ dedication in bringing this forth. It was one of the most extraordinary experiences of my life, and I still feel it today. The way they have carried this with such care is beyond what I can ever adequately express my thanks for. 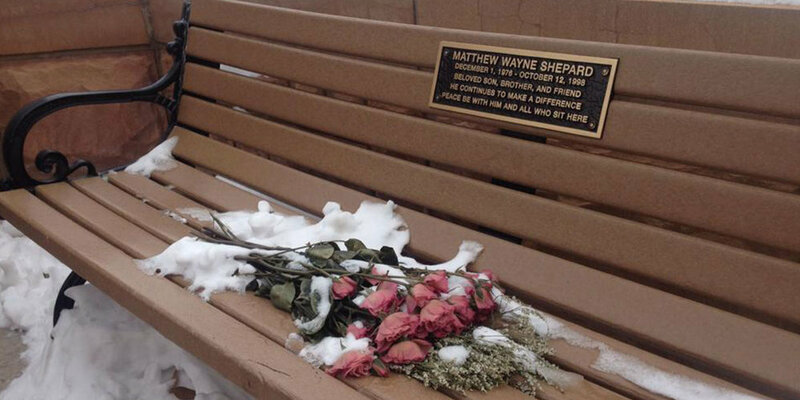 Visitors to the University of Wyoming can find a bench on campus dedicated to Matthew Shepard, inscribed with the words “He continues to make a difference.” He does, whether through the intense conversation I had with a pair of strangers on an airplane or in the creative consciousness of an artist like Craig Hella Johnson.